The most important garden tools are those used to cultivate the soil, such as the spade and fork. Careful selection is important when buying these tools, particularly their size, weight and balance. When choosing one, pick it up and go through the motions of digging with it, to ensure it feels comfortable to use. A fundamental tool that will get regular use in the garden, particularly when digging and planting. As it will be used often, it is a good idea to invest in one of good quality. Spades have many other users apart from digging, including planting trees and shrubs, cutting turf and shoveling and mixing soil. Most gardeners will need at least at least one spade, if not more. There many designs available, made from either forged steel or stainless steel. Spades with stainless steel heads are easier to dig with, as the soil does not cling to them as much and they are less likely to rust. Note: it is best to store stainless steel and carbon steel tools separately, because if wet carbon steel is left touching stainless it can cause rust areas to form on it. Spade sizes and dimensions vary from manufacturer to manufacturer. A standard digging spade has a blade of at least 7" to 8" (18 to 20cm) wide and 10" to 11" (25 to 27cm) deep. The depth of the blade is known as a spit and can be used as a measure when digging. For example, gardening books may tell you to dig one or two spits deep. Turning the soil over a single spit depth is called single digging. Double digging is when the top spit is dug-out and the second spit's depth is turned over below it. The most important question to ask when choosing a spade is: is it comfortable to handle? You will be using it quite a lot in the garden and a heavy spade can be tiring. For general digging tasks choose a tool with a forged head, where the key areas that are subject to stress, are made thicker for strength. The lower edge of the blade needs to be reasonably sharp, so it should be thinner. Spade heads can be flat or rounded or even pointed at the end. They usually have a thicker tread at the top, providing a ledge on which to place your foot for pushing. If not, then a rubber or plastic footpad can be added to protect boots and shoes. Another important feature to consider when buying a spade is the shape and design of the handle. Traditional spade and fork handles were originally made of wood but today many handles are now made from plastic and are moulded to fit snugly in the hand. Some also have shafts made from alloys to combine strength with lightness. There are three types of handles: T shaped, D shaped and D/Y shape. Fork and spade handles vary in length from 28in (72 cm) to 32in (82cm). Choose a handle design that you feel comfortable using and length that suits your height, without the need to bend down too much. Lady gardeners especially will appreciate the smaller and lighter types of spade and fork. These are normally termed as 'border tools' and have smaller heads. They are ideal for working between plants in the borders and are equally efficient at ordinary digging tasks. 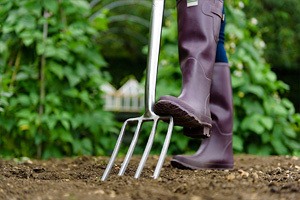 Note: if you have very heavy clay soil, then a good choice would be a narrow spade of stainless steel, as you will find this much easier to work the ground with. As with spades, forks also come in many designs and sizes, available in both stainless steel or forged steel. The most important part of a fork is the strength and rigidity of the tines (or prongs). If you buy a low quality fork, forged from thin mild steel for example, you may find that the tines will just bend and twist the first time you use it, rendering it almost useless for the task. Therefore it is worth spending just that little bit extra, on a good quality garden fork, which should last a lifetime if used correctly. Like spades, stainless steel forks are stronger and easier to keep clean, although more expensive than carbon steel varieties. The garden fork is an indispensable tool for aerating and breaking up the soil, to improve its structure. It is also good for spiking lawns for drainage, turning over compost heaps, mulching and forking in fertilizers. 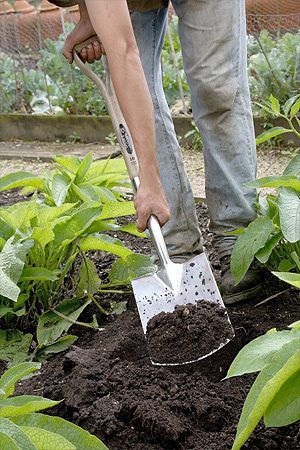 Garden forks are often used instead of a spade when the soil is heavy and wet in winter. They can also penetrate stony or compacted ground much more easily than a spade, although when turning over the earth they bring less of it to the surface. Forks are better for clearing roots and weeds, as the tines will help bring these to the surface, whereas a spade will just cut through them and dig them in. Two forks back-to-back can also be used to divide a large clump of fibrous rooted plants. When choosing a fork consider its grip type, length, weight and sturdiness. Make sure that the tool is comfortable to hold and the handle is the correct length for your height. Border forks are normally narrower and lighter that digging forks, which makes them easier use in densely planted beds and borders. They are a good garden maintenance tool, ideal for digging out weeds and for forking in soil improvers. The curved tines of these forks are designed for lifting and scooping manure or other partly composted material. They are not heavy duty so should not be used for digging. If you grow a lot of potatoes then the broad tines and flat ends of a potato fork can make life easier. They are designed to cause less damage when lifting the tubers. They are also very useful for harvesting other root crops. Other tools for cultivating the soil include mattocks and pick axes, ideal for excavating channels or digging out rocks. Also heavy-duty digging hoes (or azada) can be used for working very heavy or stony ground. Powered cultivators or rotavators are ideal for digging over large areas of soil. The basic types have a rotating head which extends in front of the power unit, where the soil is churned over by its rotary blades. For more heavier work, larger cultivators have their blades towards the black of the tool, which makes the machine more stable and easier to control. They can also have power driven wheels, making the task even easier. The cost and expense of a power cultivator cannot always be justified on a small vegetable plot, so it is often more cost effective to hire one.